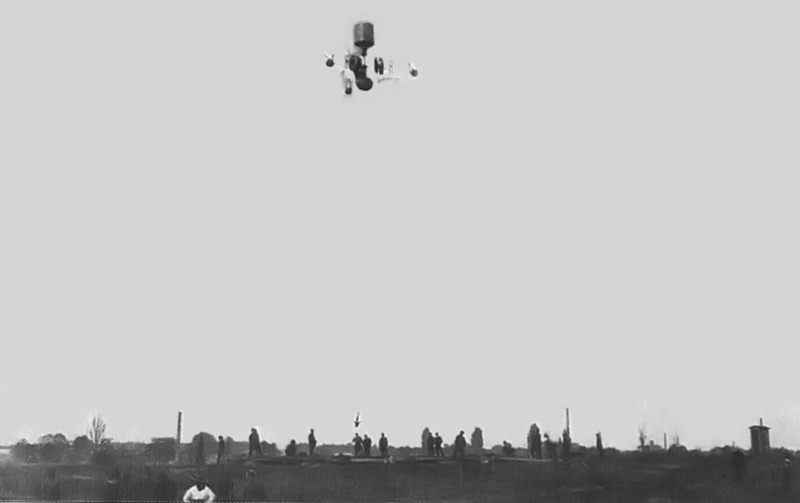 In 1916, Major Stephan Petróczy von Petrócz of the Austro-Hungarian Army envisioned replacing hydrogen-filled observation balloons with tethered helicopters. These helicopters would have been used as static observation platforms. Compared to hydrogen balloons, the helicopters’ were much less likely to catch fire, presented a smaller target for the enemy, increased operational readiness, required fewer ground and support crew, and eliminated the need for hydrogen generating equipment. Follow-on to the PKZ 1, the Petróczy-Kármán-Žurovec PKZ 2 is shown here with the observation basket attached above the rotors. This image was taken after the PKZ 2 was modified in May 1918 and the 120 hp (89 kW) La Rhône engines are installed. 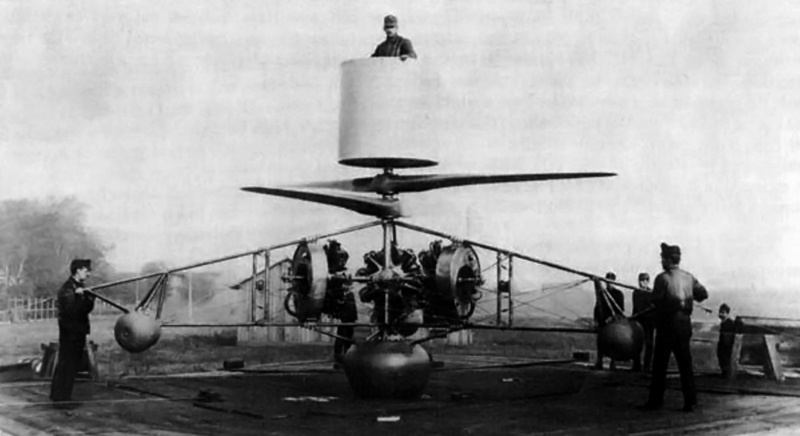 To achieve his goal, Petróczy, along with Oberleutnant Dr. Theodor von Kármán and Ingenieurleutnant Wilhelm Žurovec, conceived the Schraubenfesselflieger (S.F.F) mit Elektromotor (captive helicopter with electric motor). This machine is now commonly refered to as the Petróczy-Kármán-Žurovec 1 (PKZ 1) helicopter. Built in 1917 and primarily designed by von Kármán and Žurovec, the PKZ 1 consisted of a rectangular frame with an observation basket in the middle. On each side of the basket were two lift rotors. All four rotors were powered by a single 190 hp (142 kW) Austro-Daimler electric motor. The PKZ 1 was flight tested and was able to lift three men to a tethered height of 20 in (50 cm). However, the electric motor generated 50 hp (37 kW) less than anticipated, and on the fourth flight, the straining motor gave out. Because of the scarcity of high-grade electrical copper and quality insulation, Daimler was not able to repair the motor. In addition, the PKZ 2, which was originally known as the S.F.F. mit Benzinmotor (captive helicopter with petrol engine), was nearing completion. No further work was done on the PKZ 1. PKZ 2 rotary engine arrangement with the 100 hp (75 kW) Gnomes installed. The PKZ 2 helicopter (for which he received German patent 347,578) was designed solely by Wilhelm Žurovec. The PKZ 2 was privately funded by the Hungarian Bank and the iron foundry / steel fabrication firm of Dr. Lipták & Co AG, who built the machine. The PKZ 2 utilized two two-blade contra-rotating rotors to cancel out torque and provide lift. The rotors, made of high-quality mahogany, were 19 ft 8 in (6.0 m) in diameter and were rotated at 600 rpm by three 100 hp (75 kW) Gnome rotary engines. A removable observation basket sat atop the rotors. The craft had three outrigger legs; each supported one engine. 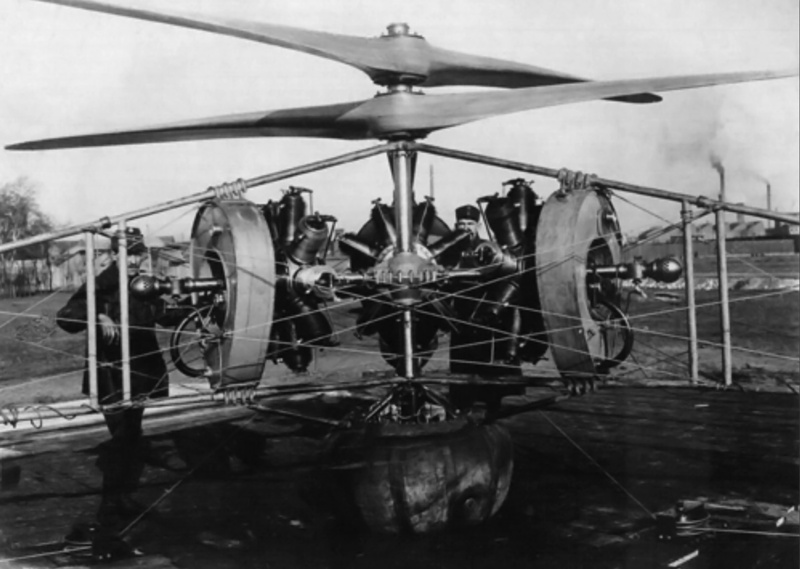 All engines were connected to the rotors via a common gearbox. The PKZ 2 was supported by a central air cushion and three additional air cushions; one on each outrigger leg. These air cushions were filled by an air pump driven from the rotor drive. Attached to each outrigger was a tethering cable that was connected to the ground and controlled by an electric winch. With one hour of fuel, The PKZ 2 weighed 2,645 lb (1,200 kg). PKZ 2 shown just off the ground and without the observation basket on 5 April 1918, powered by the 100 hp (75 kW) Gnome engines. Tethered and unmanned, the PKZ 2 was test flown on 2 April 1918. After several flights, including one that lasted about an hour, tests were suspended on 5 April because of insufficient power from the Gnome engines. The engines were replaced by 120 hp (89 kW) La Rhône engine (that were captured and rebuilt) and, with a few additional modifications, tethered and unmanned flight tests resumed on May 17th. With the new engines and calm winds, an altitude of 165 ft (50 m) was achieved, and the PKZ 2 could lift 330–440 lb (150–200 kg). The craft would lose lift at higher altitudes, but the PKZ 2 was kept under control as long as tension remained on the tethering cables. PKZ 2 in a tethered high hover with power provided by the 120 hp (89 kW) La Rhône engines on 10 June 1918. On 10 June 1918 the PKZ 2 was demonstrated for high ranking members of the military. A flight was made with the observation basket in place, but the engines were not running well and the craft became unstable. The basket was removed and another flight attempted. The wind had picked up, and as the PKZ 2 hovered at 40 ft (12 m) tethered to the ground, the craft began to rock. The overheating engines lost power, and the tether winch crew could no longer maintain control. The PKZ 2 crashed from a height of 6.5 ft (2.0 m), severely damaging the airframe and completely destroying the rotors. Realizing the technical problems could not be overcome quickly, the government cancelled the project on 21 June 1918. However, Žurovec pressed on and began to design an individual cylinder water jacket to water-cool the rotary engines. The craft was being rebuilt to resume flight tests in November 1918 when the end of the war and revolution caused all development to cease. The PKZ 2 made over 15 tests flights, but it is doubtful any were manned. 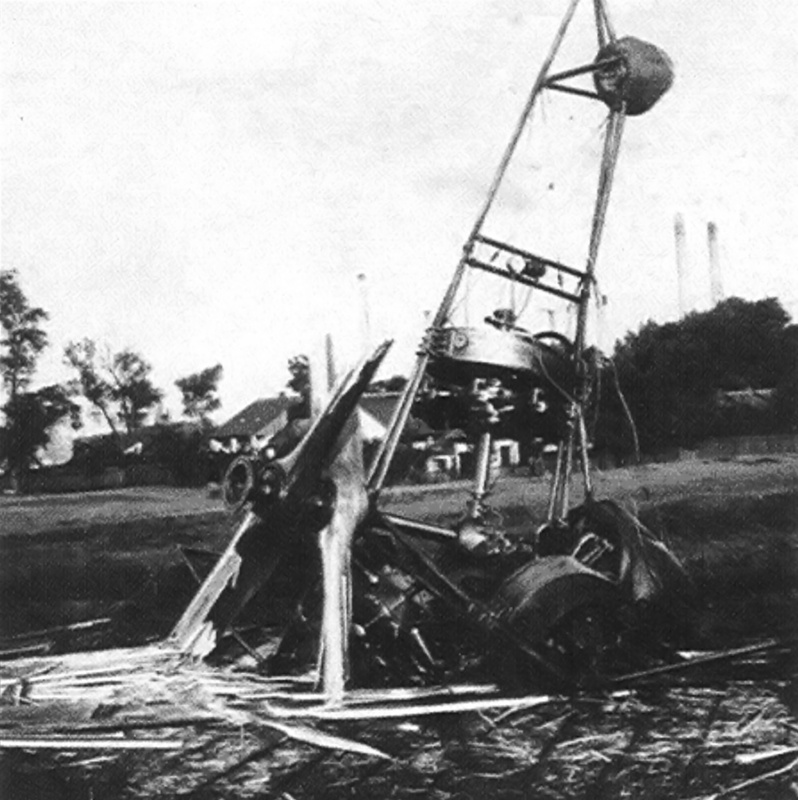 Remains of the PKZ 2 after it crashed on 10 June 1918. This entry was posted in Rotorcraft, Through World War I on 24 September 2012 by William Pearce. Hi, I am the writer of the long Dutch language piece on the development of Austro-hungarian helicopters before and during WW1. Your synopsis of the machines is quite complete, but as you are so specific with writing the names of Petróczy and Kármán (of Hungarian birth) it would be nice to include the ‘correct writing of Žurovec (of Czech birth). Names in the Austro-hungarian empire are difficult to standardize as all three had their names Germanized like von Karman etc. Although seemingly a small point contemporary (1917 / 1918) official documents never describe the two machines as P.K.Z.-1 and -2, this was probably invented later. Their official names in German were Schraubenfesselflieger (abridged as S.F.F.) and to distinguish them they were named S.F.F. mit Elektromotor and S.F.F. mit Benzinmotor. In English the German name could only be described as it is a put together of Schraubenflieger (‘helicopter’) and Fessel (meaning tied to the ground through ropes or something). As stated clearly by Žurovec the S.F.F. machines were never intended to fly free, always with the three ropes in a trapezium configuration, which made the machine stable in the air when the power was on driving the machine upwards. Correspondence between Žurovec and Kármán reveal that tests with the S.F.F. mit Benzinmotor were shot with a film camera. These movies were used by Kármán in his after the war selling lectures of the machine around Europe. Unfortunately the reels seem to be lost or maybe getting dust in some far off archive. Thank you very much for the detailed information. I am glad I got most of it right. I have updated the article with the information you provided. I hope the S.F.F. mit Benzinmotor film surfaces someday. In his autobiography, von Karman mentions the captive copter. I believe he has some story about visiting Austria (or Hungary) many years later and being shown the device by people who did not realize that their distinguished visitor was the same as the designer. This sounds like the first (sort of) electric flight — I guess the forerunner of the toy and not so toy vertical lift drones. I noticed your remarks about Theodore von Kármán and the Austro-Hungarian captive flyers (in German Schraubenfesselflieger – abbreviated S.F.F.). In his autobiography (English version – ghostwritten by Lee Edson) with the title ‘The wind and Beyond – Theodore von Kármán – Pioneer in Aviation and Pathfinder in Space’ copyright 1967 mentions on p.85-86 the pioneer helicopter experiments. As often seen with undoubtedly brilliant people, von Kármán fell into the trap to represent that he developed most of the Austro-Hungarian S.F.F.’s. He gave little credit to the engineers of the project (Žurovec and Asboth) who designed and patented the second S.F.F. known as the S.F.F. with Benzinmotor (post WW1 most identified as the P.K.Z.2). Of course the story that he was unrecognised as developer of this Austro-Hungarian ‘helicopter’ is also told (p.86-87). He saw his name mentioned in a book of Brigadier Genral Frank Gregory on helicopters in a way that a Lieutenant Kárman developed a captive helicopter in WW1 in Austro-hungary. He contacted that general to correct or augment that statement. Von Kárman was always anxious to get his name in and make his part in history greater that it was. But that is the way autobiographies go. This story is made up in his mind years after the event. The remaining papers of von Kármán show that the P.K.Z.2 (for short) was not in Fischamend but in Hungary, where it remained at least till 1921 / 1922. It was even examined by an English intelligence officer who made drawings (blueprints) of the design. Von Kármán travelled around Europe giving lectures about the captive helicopter, which were illustrated by a movie showing the P.K.Z.2 in flight. There is little doubt that he was presenting the captive helicopter as mostly his design. Not surprisingly the attitude between von Kármán and Žurovec worsened when von Kármán published articles in a German scientific magazine, where he did not even mentioned the work of Žurovec. The correspondence between Petroczy – von Kármán and Žurovec is in the archive of von Kármán. They make interesting reading, although some of the correspondance is in Hungarian …..
Not to generalise but in history the main attention goes to people who are successful and mighty and in this position can bend history somewhat in their way. Vilem Žurovec was far less successful and mighty. He was the designer of the P.K.Z.2 captive helicopter but has not got much credit for it. When you look in the contemporary press of 1919 covering the captive helicopter his name is most of the time not mentioned. Thank you for the comments/discussion Mr. Biales and Mr. Kort!